The Eurasian eagle-owl (Bubo bubo Linnaeus, 1758) is a nocturnal bird of prey belonging to the order of the Strigiformes and to the family of the Strigidae. 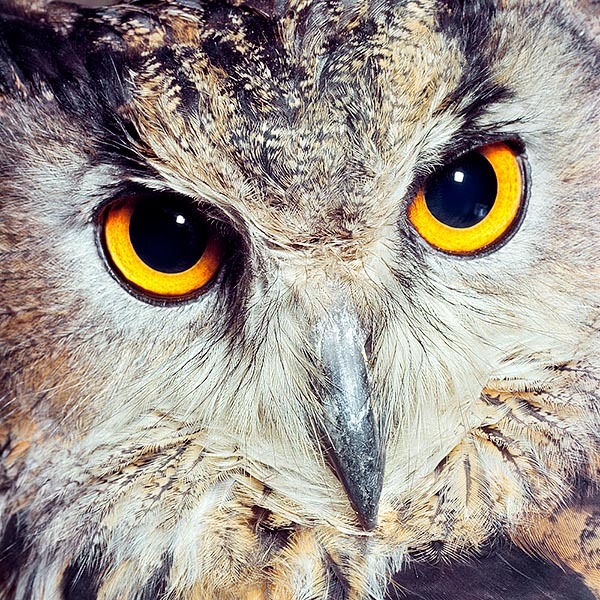 It is considered as the biggest owl in the world and by sure the king of nights in the continents where it lives. Well known since ancient times by sure not for its presence, very discreet and purely nocturnal, but for its mournful singing that has accompanied the nights of our forests and of the inacessible and rocky valleys. Its presence cannot be ignored seen the continuous cry it emits for whole nights in defense of the occupied territory. A continuous bitonal uhu uhu, emitted with regular intervals, and with absolute persistence for the entire night, in particular when defending the territory and as contact message with the hatching female. From this singing has then come, still from the classical Latin “bubo-bubonis”, its onomatopoeic name of Bubo bubo and the Italian neologism bubolare for identifying the cry. Moreover, it seems that the Anglo-Saxon term woofer, to indicate the musical speakers reproducing the low-frequency sounds, in its turn based on the onomatopoeic sound of the barking of the dogs (woof), gets its origin from the gloomy singing of this raptor. Its presence has often been linked to the witches but its figure has always been related more to the gloomy and dark environment of the forges of these fairy-tale beings than as accomplices of their spells and misdeeds. In fact, in the literary or cinematographic works the owl is often seen disagreeing with the witches intent to prepare magic potions and pointed out as source of wisdom and of contrast to the evil of with the witches are spokeswomen. With those fantastically haunting eyes, the staring and penetrating gaze, the almost total immobility of the body and the affability of the face, the owl is pointed out as the archetype of the source of wisdom. The behaviour of this raptor and of others like, has been object of several matchings that have nowadays enetered our daily language to indicate human behaviours similar to those of this sympatetic raptor, such as … to have an owlish expression, to live like an owl, to have owlish eyes. Finally, should not be missed the regal and composed look of this bird that has deserved remarkable nicknames in various European areas. 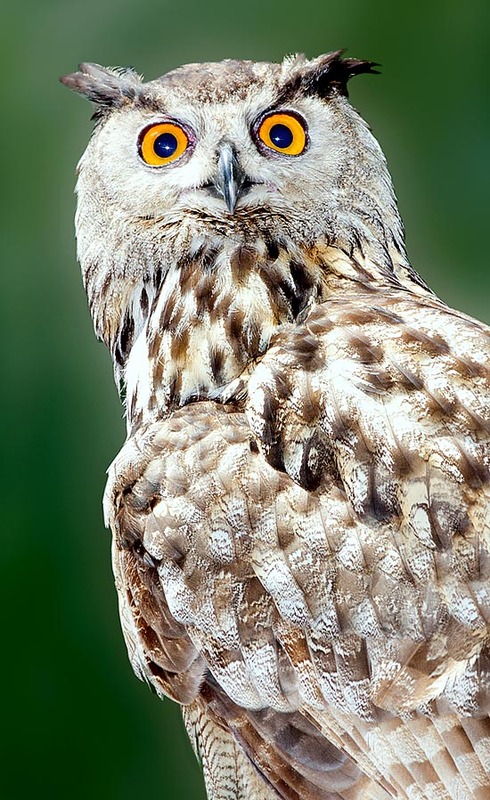 In Italy, besides reale is often called Duca reale, in French Hibou Grand Duc, in Portuguese Bufo real, in German Uhu, in Spenish Buho real, in English Eurasian Eagle Owl and in Japanese an imaginative and musical Washimimizuku. It is a bird living in Europa and in Asia, from the Atlantic coasts up to Japan, in the whole medium temperate belt limited north by the tundra and south by the desert zones. It is absent in the north western regions of Europe which include part of north-eastern France, England, Netherlands and Denmark. Conversely, it is present on a vast belt of Mediterranean coast of North Africa and of Middle East. It is absent in Sardinia and in various Mediterranean islands and beyond its boundaries the species is replaced by other congeners. Numerous subspecies have been determined, among them the Bubo bubo sibiricus, typical to the forests of Siberian conifers that proves to be the biggest as well as the clearest in the livery. Other subspecies concern geographical localizations often added to slight morphological variations. Some of the most important are the Bubo bubo bubo in the European continental belt from north of Spain up to the Urals, Bubo bubo hispanius from the Iberian Peninsula up to North Africa, Bubo bubo ruthenus from Central Europe to the Caspian Sea basin and rightly the Bubo bubo sibiricus in the eastern part of its Asian range. 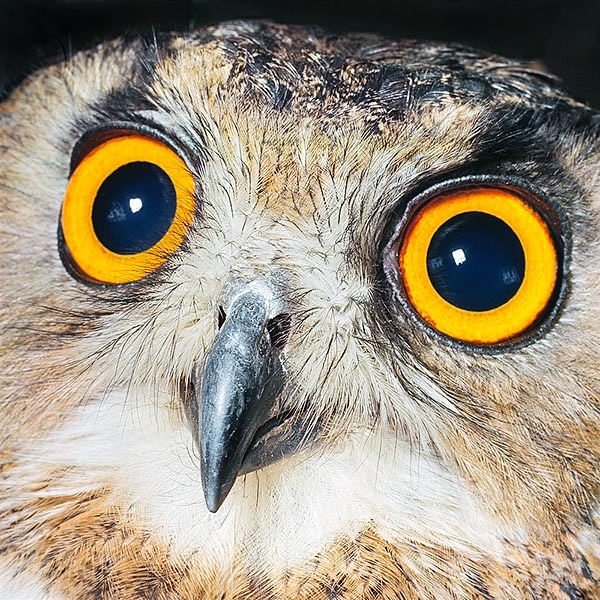 This owl lives in woody environments, forests of conifers and inaccessible valleys with rocky slopes or very steep ground littered with spikes of rocks or boulders that create small shelters. It is easily disturbed and often the anthropic disturbance is cause of definitive leaving of this species and even of abandoning of nests in whatever reproduction phase it is. Actually, one of the most frequent causes of abandonment of historically inhabited sites by this bird, is the attendance of rowdy tourists or of climbing enthusiasts who are encroaching sites once totally isolated and never visited. In Europe, it usually never exceeds the 2000 m of altitude, whilst in Asia, close to the Himalaya range, lives even beyond the 4000 m.
The Eurasian eagle owl has a wingspan immense for a nocturnal bird widely exceeding the 160 cm to reach, with the females, even the 190 and is totally silent in flight like all strigids, having the extreme part of the remiges equipped with slight indentations that nullify the vibrations produced by the flow of air. The dimensions are also remarkable having a length that may reach the 80 cm and a weight varying between 3 and 4 kg. The remarkable size variation is mainly due to the locations where they do live and evidences a significant increase in the measures going towards northernmost latitudes. In any case, the female is always bigger than the male. 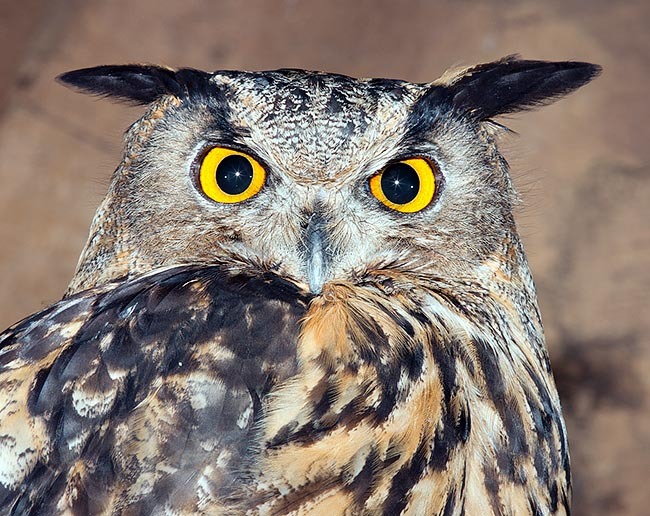 Like its similars, the Eurasian eagle-owl has a substantial ability of rotation of the head that may turn up to 270° thus having an almost total visual capacity of the surrounding environment. It has central eyes that allow an easy binocular focusing, as well as a hearing apparatus of great value having misaligned auricular holes so that it is capable to focalize with huge precision the coordinates of the sounds received. 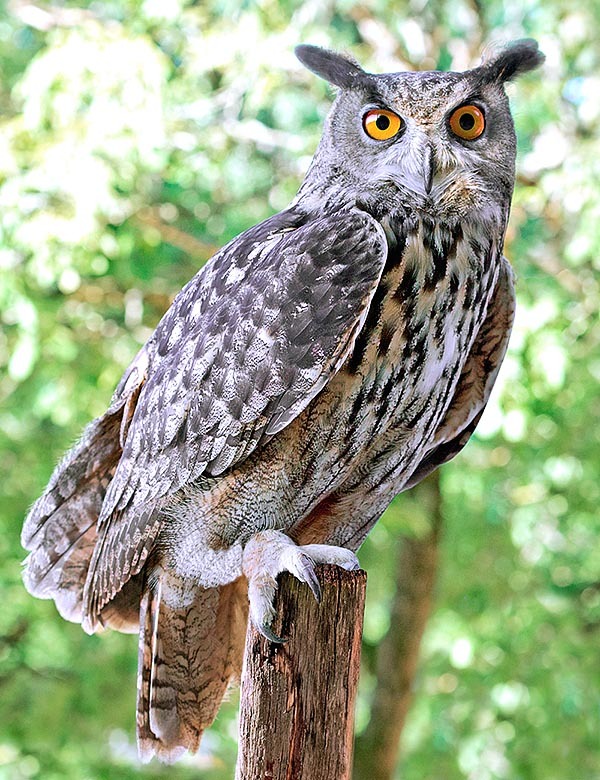 The Eurasian eagle-owl has wide wings and strongly rounded and very short tail that allow a considerable aerial lift, a quality that allows to carry even big preys in secluded places and consume them undisturbed. The head is massive and has sparkling frontal orange eyes particularly big and luminous, rightly suitable for hunting during the night and in porly illuminated sites such as the forests or heavily wooded areas. On the head it has two considerably long tufts that do not have any auditive function and that it raises as soon as it thinks to be endangered or as first warning of its presence in order to frighten the intruder. If harassed, in particular on the nest, it adopts the typical posture of swelling and enlarging of the wings in order to make its size to look bigger and frighten the possible aggressor. Same behaviour is kept by the young when, still unable to fly, drop out of the nest. The body is orange brown dotted with large black spots of various shape that render its livery fairly camouflaged in the environment where it lives. The white throat is used, swelling rhythmically, for communicating among its similars as well as for showing its nervousness during threatening situations. The claws and the tarsi are wholly and finely feathered. The beak, little visible as immersed in the feathers of the facial disk, is extremely strong and hooked and is able to pierce the skull of its customary preys. There is no sexual dimorphism apart in the size that, as we have previously said, are significantly larger in the female. The young have paler colours with a more faded dotting and with more reduced auricular tufts. The flight is rather rapid and powerful and during its nocturnal hunting it may cover various tens of kilometers reaching valley bottoms and open prairies, well far from its natural habitat. The Eurasian eagle-owl behaviour is very shy and reserved and rather difficult to be found if not through the nocturnal song. This strigid spends the whole day hidden in these rocky fissures or on old and big leafy trees, often conifers, leaning against the trunk and camouflaging perfectly. Only at dusk, often after having sent for some time its singing message, it takes off for the nocturnal hunt to its preys. Also dawn stands among its preferred moments for hunting. With its dimensions, we have not to be astonished if it counts among its victims animals having the size of a fox, big birds such as grouse, pheasants and even raptors, hares, rabbits and martens as well as deers and roe bucks. The victim is seized with the strong claws and immobilized on the ground laying upon them silently from a well high support and immediately hit in the head with the big hooked beak. If small it is usually swallowed whole or cut in big pieces whilst if big basically the owl prefers to carry it, even if laboriously, in a more covered site in order to consume it slowly. Up to two kilos victims are often taken to the nest. It often attacks also nests of other nocturnal and diurnal raptors predating the adults as well as the small nestlings. The owl, like all raptors, regularly regurgitates large wads containing hairs, feathers, bones and non-digestible parts of the victims. It is usually a monogamous species during the nidification but the pairs are deemed as unlikely stable. The period of nesting occurs usually in early spring, at times even since January with the ground still covered by snow and in purely winter conditions, considered the particular habitat frequented. 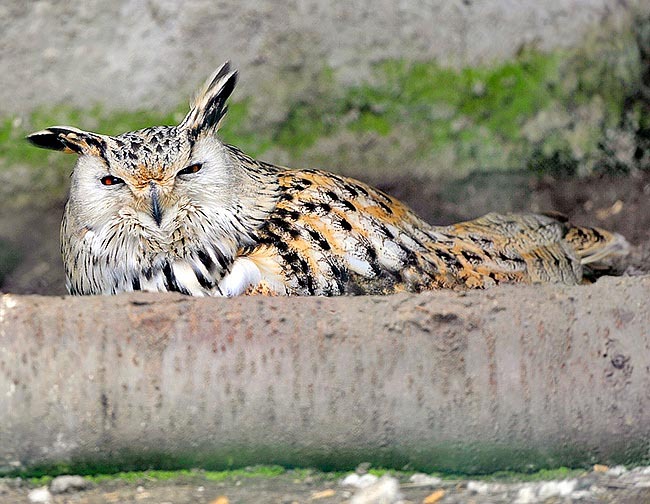 The Eurasian-eagle owl does not build the nest but usually utilizes crevices between the rocks, sheltered from the elements and from the sight, and spawns directly on the ground without bringing any other support except the few feathers lost by the female while hatching, period that often coincides with the moulting time. Some sites are visited for several years. It also uses old nests of other birds placed on trees covered by climbing plants or ample holes in old trees but only if it fails to find its choice placing. It rarely nidifies also on the soil close to woodpiles, under bushes at the foot of large trees or sheltered by fallen down trunks. It lays up to 4 white eggs, hatched exclusively by the female for about 5 weeks and the chicks keep in the nest for 5 weeks more even if the parents dependency lasts for further three or four months. As often is the case for the owls, the young usually leave the nest also when they are not yet capable to fly and scatter around hiding in crevices not far from their native place. Only around the seven, eight weeks of life the young are able to take the flight. As it is a bird having strongly entered the falconry, perhaps more for the exhibition of its power than for the hunting practice, it has been possible to verify that these raptors in captivity may reach a considerable age up to exceed the 50 years of life. In the wild it is thought that this life expectancy stands around the 20 years. In some areas it is a bird in expansion that is slowly civilizing also large urban centres even if in the whole of its range, is to be considered often as in strong regression. It is anyway protected in all the continents and is not considered as an endangered species.